OpenID has been gaining momentum in the last year, with support from Google, Yahoo!, Microsoft, AOL, Plaxo, and a growing list of companies. And just last week, OpenID was mentioned on the Today Show, of all places. So it muist be mainstream? Well, almost. From here to mainstream, we need to see much better user experience. Clickpass and Yahoo! have made progress there already, but more is always welcome. Today, JainRain, a small outfit that is a driving force of the OpenID effort, introduces an ID Selector wdiget. What is it? Great to see efforts like this that aim to make adoption of this important technology easier, both for sites and for users. 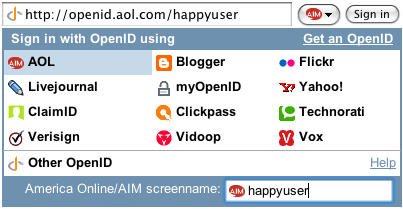 That said, I tend to agree with Allen Stern that broad adoption will likely come not from getting users to embrace OpenID, but by making OpenID invisible (as in the Clickpass implementation, for example). Nice writeup by CNET’s Rafe Needleman at Webware, here.